Tip #1: If you skipped doing any quests in this zone at all, do the Sealegs one. No really. Ghostcrawler is REALLY FAR DOWN IN THE WATER. Tip #2: Failing tip number 1, bring those Nagrand Cherries in your bank that you kept for some reason not even you can explain. If you fail to do one of those two things, you may end up felling quite silly if you spot the spirit beast but then have to go back and do the quest real quick in order to NOT DROWN. No, I’m not speaking from personal experience, why are you looking at me like that? I was going through my feed reader’s backlog when I ran across this post from Blessing of Kings. This is always a topic that will get my knickers in a bunch, so let’s get started, shall we? High-skill players almost always use the optimal spec or strategy. There are a few exceptions, but they are very rare. The vast majority of the time, someone with a non-optimal spec turns out to be a low-skill player. Encouraging medium or low skill players to feel that they are a “special snowflake” and don’t need to use more optimal builds dooms them and their group to mediocrity and failure. You have enough trouble with lack of skill, why further handicap yourself with a sub-optimal build? And even the high-skill player with the sub-optimal spec does her group a disservice. If the high-skill player switched to the optimal spec, odds are she would play at an even higher level. I always resent the whole “you’re holding everyone else back” flavor these discussions take on. Sure, in a situation where you’re doing hardmodes, I can understand, and there’s truth to it–in that situation. But, ladies and gentlemen, World of Warcraft is a game. We play games to have fun. 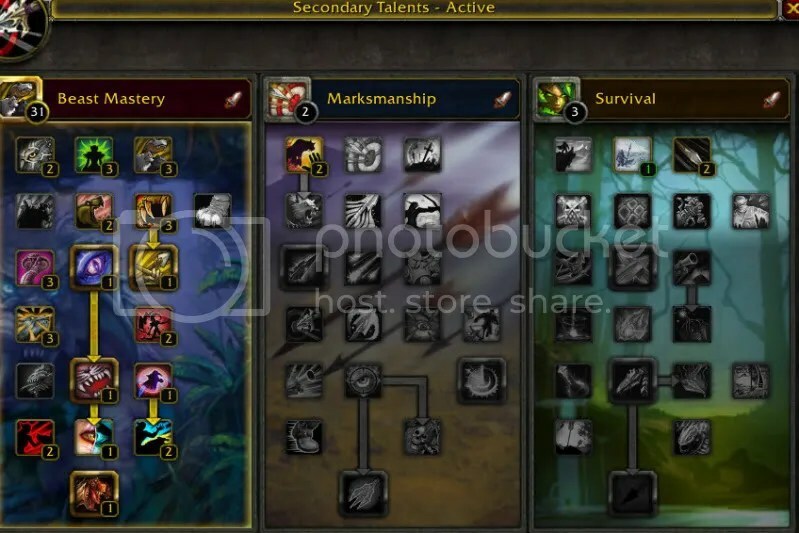 If I love raiding but the spec/class I enjoy most is (we’ll go with my favorite example) Beast Mastery Hunter, and BM hunter isn’t the current top spec, does that mean I shouldn’t have get to raid? Does that mean that because I happen to enjoy something not the Flavor of the Month, that I am a less than stellar player? Not at all. I know several people that are very excellent players and chose, at some point or other, sub-optimal specs. If you haven’t been so lucky then you’ve been looking in the wrong place, for there’s plenty of them–in guilds like mine. My guild is full of people playing non-optimal builds. For a guild that raids only twice a week, we’re still clearing content at a reasonable rate. I dare you to ask anyone in SiB if they think they are doomed to an existance of mediocrity and failure. We may not have a place in your Epic Guild of Awesome Leetness and Hardmodes, but we are not lesser players for it. 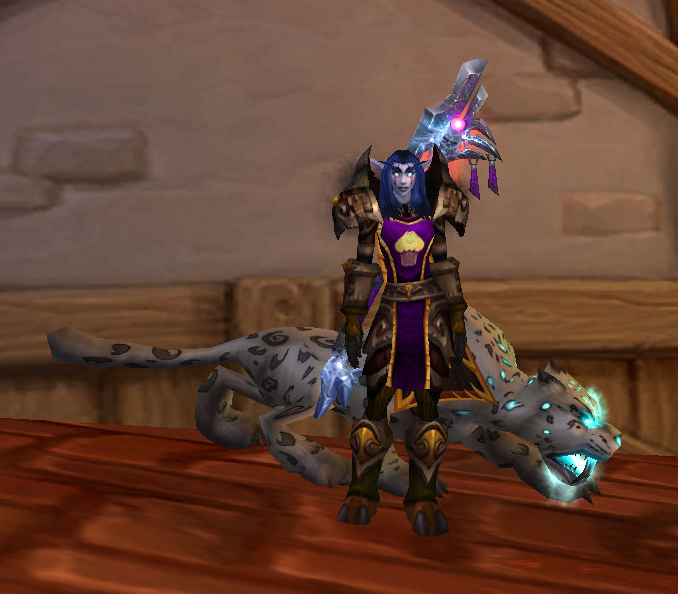 We’re just over here enjoying playing our game the way we find most fun, and collecting shiny purples for it. You’re more than welcome to play your perfectly valid interpertation of the game over in your corner, but the holier than thou attitude could do with a nerf. My pokemans, let me show you them. Named Softpaw, after that thing my cat does to my face when I'm not petting her. AYearLate, because he is. Mother fucker. Fuzzbutt. What ELSE was I going to name a bear? 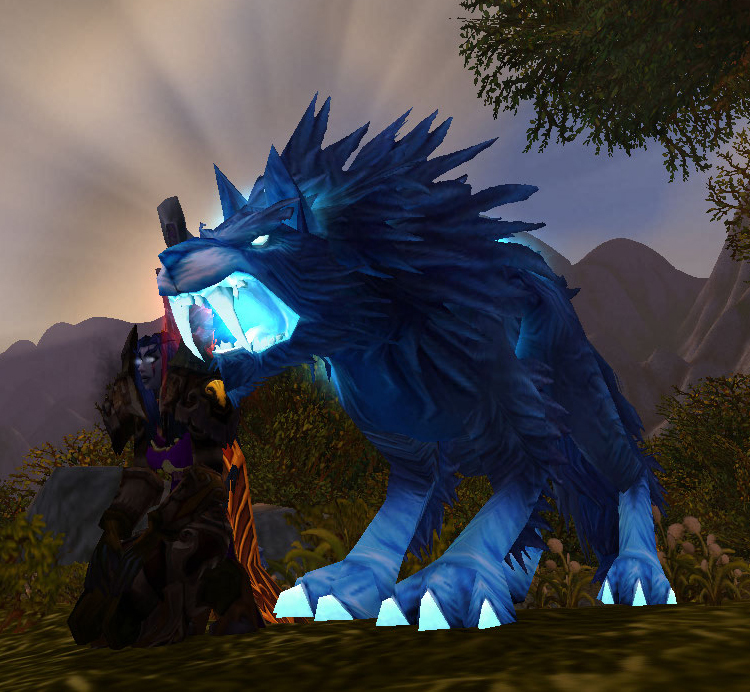 I want to find whoever thought it would be an awesome idea to give spirit beasts multiple spawn points and beat them soundly. Back in The Day, I camped Humar. He had a 7 hour spawn timer but only appeared in one place. He was easy to camp–you sat under the tree and waited. If someone else tamed him, you knew it and could wander off until later. You don’t have that luxury with Loque. Maybe he spawned somewhere else and was killed, or was tamed, but you’d never know. You just know that you must do laps around Sholozar, forever, because when you leave is when he will spawn. You know it. No. No, King Krush apparently spawns in that location, too. Hopes dashed and anger riled, I tamed out him of spite. Just in damn for another hunter to swoop down and say “Gwuh”. Oops. I’M SORRY I HAD TO TAME HIM ME MADE ME ANGRY. NOW HE SHALL FOREVER BE FORCED TO DO MY BIDDING. By this point, years into my casual hunt, it’s comically exasperating. 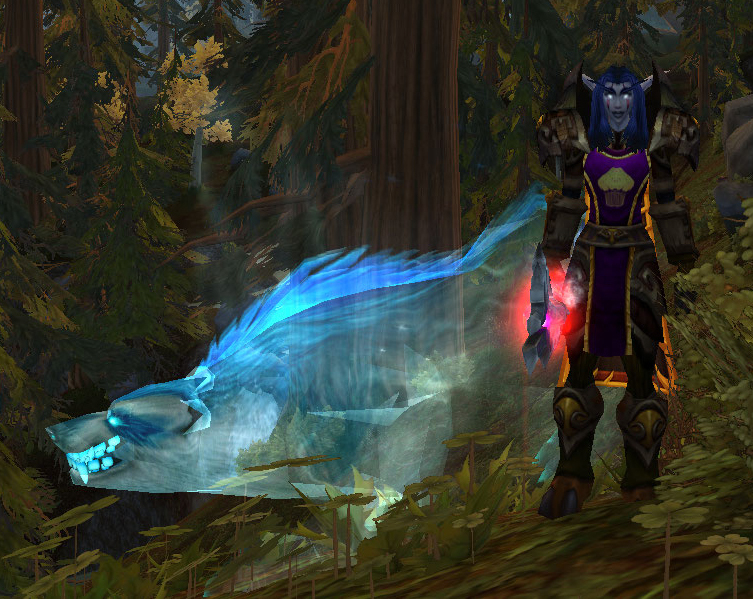 I have tamed–or passed up the chance to tame–every other Wrath spirit beast. I did exactly one pass searching for Gondria and found the other two by accident. I’ve stumbled across the other two rares in Sholozar. Yet the beast I actually search for eludes me. ETA: Psst! 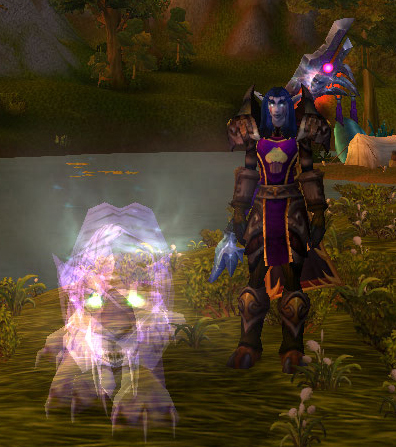 Mortigan the lock is back, and he’s not even a dirty hordie anymore! Go say hi! I’m not a math person. I’m far more likely to slog through the mathy guides and try to “translate” them into something more palpable (and amusing) than I am to try to generate numbers myself. These are trying times, however, as the math gods of EJ are distracted by the shiny numbers at 85 and I cannot rely on them to do the hard work for me. So! I slapped an alternative spec into my other tab and decided to test it on dummies FOR YOU. Don’t you feel special? You should. I’m normally too lazy to do anything so technical. The BM portion of the spec is relatively standard. Two points should go into Go for the Throat–nothing has changed there. But what about the other points? There. That is my spec. Effeciency was also tempting, but I opted to play with Improved Serpent Sting and…and um, whatever the other box is, that gives you haste. In my “haste = more focus regen = less fail?” line of thought I was curious to see if putting full points in that would help. Now haste value is one of those subjective things. How much latency do you have? How much haste is already on your gear? it could be that you’ll hit one of those magical sweet spots and it will do uber magical things for you but generally speaking…eh, go for full ISS and be done with it. And you might have already known this or it may be patiently obvious to you more mathy types but WHATEVER, I TRIED FOR YOU.